Below are with out graphs or text. Table values above are for final rainfall greater than 0.1 inch over the hour. Ok, let's up the ante. I just read that rainfall above 0.8 in/hr have zero chance of being usable 1 hour out. Values below are only for predicted OR final rainfall greater than 0.8 inches. Begin Aug 2016. Note: Update Jul 12, 2016 a lot more often than not, errors less than 100% are event under estimates (alarm bells), 100% means 0 forecast, and greater than 100% means most event predictions over by AT LEAST 100%. It's event mean UNSIGNED error remember. I should probably add a sign to them as - under forecast, + over forecast. Signed unsigned errors. Hey science aint science till it's enginerring. NWS=National Weather Service average 6 hour QPF provided in equal hourly values. NWS-2=Distribution type 2, Dallas 4 hour. NWS-3=Distribution type 3, Vegas 5 hour. NWS-4=Distribution type 4, California 6 hour. NWS-5=Distribution type 5, Stepped Pyrimid 6 hour. NWS-6=Distribution type 6, Pyrimid 6 hour. Adjust type 1=hour 2 values average of hours 2 and 3 and not recommended. HRRR=Multi Radar Multi Sensor HRRR radar reflectivity forecast. I believe HRRR is based on the highest reflectivity in the clouds and if it behaves like the composite of angles then probably needs a 0.5 factor adjustment for surface rainfall rates. I'll wait for some results before adjusting. Adjust type 2=prorated adjust factor 0.6 to 0.4 for minutes 120 to 180 if count of 5-min rain > 0.05" greater than 2. This means heavy rainfall 3 hours out will only be 40% of that when it reaches the basin. I've been burned too often. Adjust type 3=in addition to the decay of type 2, type 3 will decay hour 2 only with a prorated 0.8 to 0.6 factor if 5-min hour 2 rain count > 0.05" decreases by more than 3 from last run hour 3 or if count is > 6. Hour 1 will decay only with a prorated 1 to 0.7 factor if hour 1 count decreases by more than 3 from old hour 2. Have to try something. Note about Squalls: Radar watching VillaAL14 above showed that NWS storm cell direction for squall lines need a +30 degree correction if used for rainfall forecasts. The cells are moving as they say but the squall line is rapidly advancing +30 degrees and the squall line is moving faster than the cells inbedded. GetRealtime's nowcast has the +30 direction corrected to the winds aloft and works great but the squall line can surge at 2 to 3 times the winds aloft speed. I could see the squall line approaching for several hours but the slow wind speed showed zero rainfall untill wham! Then the slow wind speed over estimates the time the squall is over the basin and so over estimates rainfall. I should start a new section of comparisons with manual speed and direction set using GetNexrad with a 6 hour expiration... but I don't have that much skin in this game. Getting these comparisons up and going was a bit of a challenge for me. The rainfall MAE is ok once I figured out what I was looking at. But how the Hec to table the runoff on small basins and be fair to the NWS 6-hr forecast is beyond me. You will just have to settle for "the vibe of the thing" by looking at the hydrographs below with an eye toward volumes. The Adjust Type comparisons use adjacent subbasins so are not the same. These comparisons make use of GetRealtime's ability to write to M-tables as M-odel runs what ever is written to the R-eal database tables and then not over written by the next run. I expect to improve all this with experience but for now tighten your thinking cap cause you're in for a bumpy ride. Comparisons of "3" hour radar rainfall Nowcasts. The forecast period will be at least 2.5 hours to 3.5 hours depending on when the nowcast was made. All these model runs start just after the topof the hour every hour so are close to 3.0 hours. Nowcasts are made using the last available radar image and moving the basins upwind every 5 minutes to cover the 3 hour nowcast and always ending at the top of the hour. Normally when rain is in the area, model runs would be made at intervals of 30 or 15 minutes, but not for the study here and I don't know what affect that has other than to replace a bad hour 3 as soon as possible with nothing. The direction and speed is based on NWS OP40-latest winds aloft which is updated every hour. The radar adjustment applied is the defualt Gage/Radar ratio Hour 2 (13th to 25th step) of the nowcast will be the average of each 5-minute value and the value 60 minutes later if 'Adjust Type=1' used. The last data series is considered the final G/R Adjusted radar rainfall OR it may be final Unadjusted radar OR rain gage average for NWS comparisons depending on what was being saved with 'Run-' to the 'mtables'. Under all this is the hourly average of the NWS 6 hour forecasts for the next 7 days, God luv'm, that can change the runoff graphs abruptly as the NWS changes their forecasts. These runs are being saved here to see what can be learned in some sort of fashion and I have no idea how bad Nowcasts should be. The NWS forecasts are usually pretty good for tomorrow or more and these Nowcasts are usually MUCH better than the NWS 6 hour forecast for the next 3 hours but they've proved me wrong before elsewhere... and often. MAE% is mean absolute error and generally will use only final values greater than 0.1 inches rain. If you look closely at the beginning of each graph you can spot the final series as the one that is plotted on top of all the others. Note: There are 2 wind farms with very high reflectivities about 80-90 miles to the west so the 3rd hour for wind speeds greater than 40 mph with headings 80 to 107 degrees East will not be good. Headings 92-97 should pass between the two demons. Most nowcasts are every half hour with some 1 hour and at noon there was no rain on the nowcast so the model set it's schedule to be run next at 15:00... bad idea to use 3 hour schedule when rain in the area. 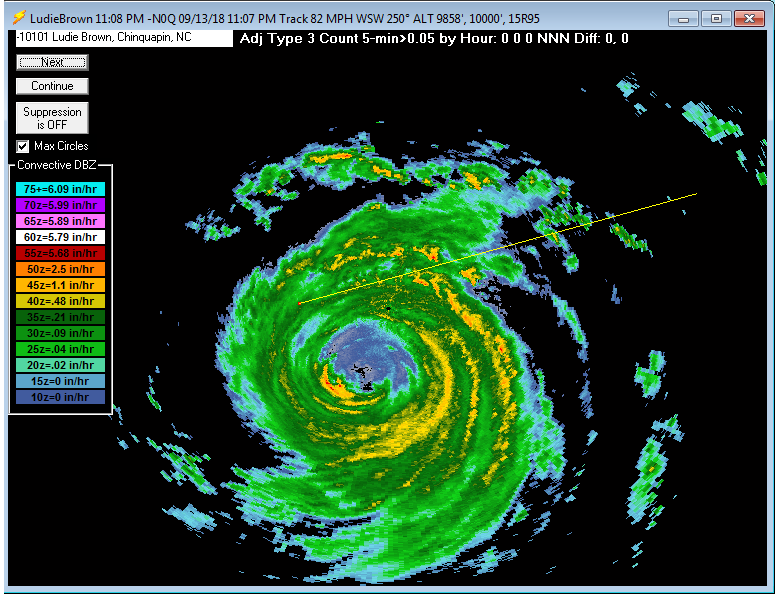 The stratiform winds aloft were verified manually a few times using GetNexrad but seemed even better than my eyeball. I had set the runoff to be written just every 6 hours so I missed most of it but the NWS forecast did fine until hour 10:00. Most nowcasts are every half hour with some 1 hour. The stratiform winds aloft were verified manually a few times using GetNexrad. Snow occurred and Wundergages showed about 0.5" of melt the next day and who knows how much wind induced undercatch due to snow there was so radar adjustments are iffy. So take with a grain of salt and why final values should be unadjusted raw radar for the mission here. Most nowcasts are every half hour with some 1 hour. No final hourly radar>0.1" so no MAE. There are 2 wind farms with very high reflectivities about 80-90 miles to the west so the 3rd hour for wind speeds greater than 40 mph with headings 80 to 107 degrees East will not be good and explains the high 3:19 hour 3. And to top it off, this is the typical direction for rain events. Where did the good ol' days of nuclear go? Nowcasts are every 1 hour. The wind speeds and direction missed the wind farms. I screwed up the hourly radar flagging until about 10AM where only 2 hours were being flagged. So I think hours 1 and 2 are really hours 2 and 3... but I'm not sure so I will leave it alone. Nowcasts are every 1 hour. The wind speeds and direction missed the wind farms. After the rain stopped I raised the winds aloft altitude from 10,000 ft to 12,000 ft because I didn't like the direction and speed. The change put it back in line with what I was seeing but now it's right back over the wind farms. Nowcasts are every 1 hour. The wind speeds and direction missed the wind farms. Stormtrack: BHM 18000ft winds aloft BAD IDEA!!! Nowcasts are every 1 hour at hh:46. The winds aloft at 18000ft were 101 MPH. Not a good thing. I loaded the winds aloft file on a GetNexrad loop and the 3 rd hour was halfway to New Orleans. This completely missed the storms traveling about 50 mph and I have since lowered the altitude to 12000ft. The NWS had the right volume from the start of the day but a few hours early (probably used 100mph winds) and I had nothing with 100 mph winds. Nowcasts are every 1 hour. I was comparing wind speed and direction every hour with my eyeball using GetNexrad and didn't like what I saw. 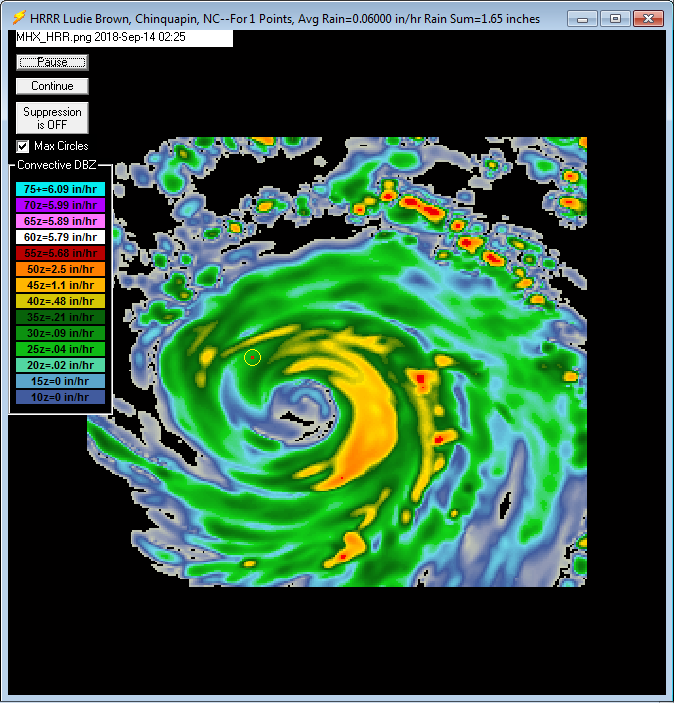 17:11 shows typical eyeball speed and direction. I finally decided to hardwire the direction in GetRealtime at 18,000 ft and let the user set the speed altitude which I kept at 9800 ft. This put the direction and speed right on target but a little late in the game starting 21:08.
begin direction from 18000 ft, speed at same 9800 ft.
#3) Jan 26, 2016 FUBAR FUBAR FUBAR! Although the MAE's were 22%, 31%, 51%. Precip type: Cold front stratiform rain. Nowcasts are every 1 hour. I checked each Nowcast and speed and direction was right on... until the cold front approached and thats bad news. You have to manually do the nowcast then. I didn't till to late. The major problem was not the Nowcast radar, it was that the radar was so far out of wack it needed a 0.5 G/R adjustment, not the default 1.0. The NWS whipped the snot out of this runoff compared to Nowcasts. FUBAR!!! Nowcasts are every 1 hour. I only checked the radar at the end of the event and the directions were going 120% apart from one side of the basin to the other. Must have had a low pressure move right over the basin screwing all of this completely up.... and SNOW did not help the rain gage readings. Nowcasts made once an hour at hh:33. I didn't think conditions warranted running the runoff... dang. The pink series is using yesterday morning's NWS forecast. In this business you need the USA radar going 24/7 to keep up with it all.... or have all your basins running everything 24/7. Precip type: I wasn't watching. 1--Ive seen enough alreadty to say Woo Hoo!!! And you don't have to do anything... but it can and will bite you if your snoozing during the Big One... the NWS winds aloft aint your mama. 2--Based on hour 2 MAE I'm starting to think my simple Adjust Type 1 is a bad idea. I'm saving both Adjust Types at Birmingham so we will see eventually. I have since stopped using Adjust Type 1 and will now try Adjust Type 2 which is a proration of adjust factor 1 to 0.4 for minutes 60 to 180 if 5-minute rain > 0.05". 3--Beginning Jan 10 after 9:00 AM I changed the nowcast period from at least 3 hours but possibly 4 to 2.5 to 3.5 hours based on the final radar image time. The nowcast always ends at the top of the hour so if it's minute hh:30 to hh:00 then 3 to 3.5 hours will actually be forecast where hh:00 would be 3 hours. If it's hh:05 to hh:25 then 2.5 to 3 hours where hh:05 would be 2 hrs and 55 min. This also means for last images dates hh:00 to hh:25 then 3 hourly values will be flagged 14, else 4 hourly values will be flagged 14 for nowcast for database queries used in the analysis here. So hourly runs NEAR the top of the hour should provide reasonably consistent populations. When I move to 30-minute samples I.... 'll cross that bridge then. 4--I've also added 'Mtables OFF' checkbox under the batch so you can make runs without disturbing the Mtable sequences by injecting ill timed runs. You would only want to do this if your doing something like what I'm trying to do here with automated Excel sheets. M-tables are used by GetRealtime to save whatever you want as the model is writing to the 'real' database R-tables also. 5--The lake effect snows comming off of Lake Erie are a lot closer to the ground than radar mid-beam scan elevation of 10,000 ft. I set my winds aloft altitude to 4000 ft for the winter in New York based on manual GetNexrad tracking. Apparently radar sees everything whether it's looking at it or not. It will probably bite me when the wind shifts from the south. 6--If your wind direction runs you off your N0Q radar image, then set GetRealtime to use the Iowa Mesonet's map cutting web service to create real-time radar images for any location at any size and you probably can get by with half the 1000x1000 pixels of N0Q. 7--The Birmingham storms have led me to hard wire the wind direction at altitude 18,000 ft and the user will set the speed altitude to suite, probably below 12,000 ft... or optionally both altitudes may be set. GetRealtime.exe has been updated. 8--Cold/Warm Fronts tend to end badly. The winds aloft countinue as they have but the trailing edge of the front rapidy moves eastward as the storm ends leaving high hour 2 and 3 rains which then turn out to be zero. I have added the option to use the Maddox 30R70 rule to shift direction and speed if needed. 9--But this was a minor snafu compared to unadjusted radar vs G/R adjusted which can be running at 0.5, not 1. I have updated GetRealtime.exe to use the average of the last ratio and the default ratio for adjusting the nowcast period to help this... but this could be tricky when the last ratio is 3 and then the next is 0.6 like what happened here so I'll keep an eye on this. 10--When the winds are blowing 60 to 90 mph to the SE, hour 3 is just looking at some greenish haze, not real radar. Nowcasts aside, I've been getting better results at Village Cr with the NCQ of Iowa's composite compared to GWX at this basin's 100 mile range so this is a simple change for making Nowcasts get a fair deal. NCQ way over estimate rainfall and generally need at least a 0.5 G/R ratio adjust. If as I think it will turn out, hour 3 nowcasts are a pipe dream for Thunderstorms so I doubt much help will be found with composite radar, but we shall see. 11--Nowcasts 3 hours out ALWAYS if big never pan out. I have updated GetRealtime to take hours 2 and 3 with a grain of salt but will probably still over shoot. 12--In Arizona mountains with summer winds at 15 mph, sometimes the storm cells advance from the oppisite direction at about the same speed. I guess condensation is advancing thru the water supply at twice the speed of air mass movement. In this case one could manually set speed and direction using GetNexrad with expiration in 24 hours. 13.--If the best the NWS QPF can do is 50% low then, adding 2*P1 to the GetRealtime setup NWS forecast line is beginning to look like a good idea. 14--Using one of the distribution types on the NWS 6-hour QPF's will definately improve NWS forecast if you should decide not to use Nowcasts. I recommend a 2 hour Nowcast with a NWS distribution. The 3rd hour of a Nowcast will likely be worse than the distributed NWS QPF for hour 3. If using a Nowcast then you may (see 11 above) want to copy distribution 2, 3, or 4 to a distribution greater than 4 so that the average NWS QPF is used for the next 6 hours but still distributed beyond 6 hours (see Help). All seems to work pretty well out to 3 hours unless you are in the Southern US with prairee fire squalls and mega thunderstorms the norm rather than exception. The problem then becomes from what direction to look at the radar. So 1-hour nowcast is the easy way out here and go with the NWS QPF with a distribution (always use a distribution). You can manually override winds aloft with GetNexrad for storm direction if your not asleep. Or like I'm now testing in Alabama, just a permanate 30R70 adjust for the 3 hours and go back to bed.... Or just use the NWS 6-hour forecast with a distribution, my adjustments for hours 1, 2 and 3 seem to work pretty darn well... sometimes. The literature says: "Lee et al. (2009) found that the Critical Success Index CSI decreased with increasing rain rate and forecast lead time: the CSI for 60 minute rainfall forecasts decreased from 0.60 for 0.1 mm/h to 0.2 for 10 mm/h rain rates. Ebert et al. (2004) reported that the CSI for rain greater than 20 mm/h is essentially zero. This implies that the use of nowcasting techniques to predict the precise location of extreme rain for flash flood warning may not be viable." Hence the 0.8 in/hr table at top to see how true this is. Because of their high speed and curved wind directions using a Radar Nowcast is not a good option, maybe 1 hour nowcast may work. Looking at the HRRR future radar forecast vs the NWS 6-hour blocked average foecast it looks like the NWS forecast is the best way to go for the NEXT 3 HOURS. 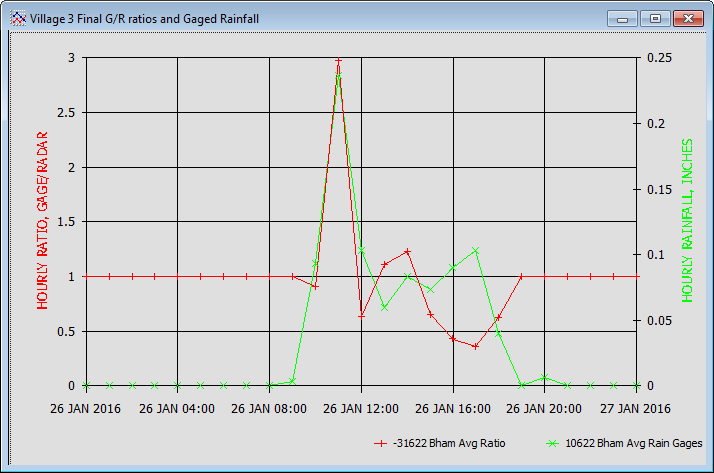 You can see 2 gages I watched, FloGage#1 and FloGage#2, at the top for listings rain>0.8 in/hr.